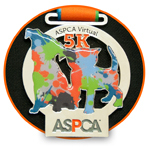 Bubs and I are training to run 3.1 miles together in Liberty State Park for the inaugural ASPCA Virtual 5K this June. Exercising with Bubs is super annoying but I'm so happy to be running/jogging/shuffling for a cause with my soul sister. I wouldn't have my Bubs (or Walter) without the work of animal welfare organizations. You can support this important work by making a donation to the ASPCA. Because every home should have a Bubs, and every Bubs should have a home!